Here’s an example of a public school auction that has made small changes every year to improve. Headwaters Foundation raises money for the rural Rappahannock County, VA public school system, which services fewer than 1000 students. At one time, it was one of the poorest counties in Virginia. It might still be. The county is located about 90 miles west of Washington, D.C. To arrive at the venue, you’ll wind around the base of the Blue Ridge Mountains, passing a combination of roadside farm stands and upscale vineyards. This year was the eighth year I’ve worked with the nonprofit. The group reached out in 2009 after a committee member read about me in The Washington Post Magazine. They wanted to grow their auction, they needed new ideas, and they were ready to embrace change. As with many nonprofits, Headwaters Foundation took some ideas and passed on others. Each year, we revisit some auction ideas, and I’ll share new concepts developing in the industry. Discussion ensues. Every fundraising auction is unique, so new ideas must be put into context of their event. We consider what would work best for the venue, the crowd, and the timeline. We discuss factors like other programs launching, or how to highlight an anniversary year. This is their signature event and it needs to have their stamp of individuality; it can’t be a carbon copy of other area events. In addition to their decision to hire a professional benefit auctioneer in 2010, the past eight years has seen the group experiment with other changes. Changed venues. Initially this event was held in several tents in a field next to an old schoolhouse. The last few years, the event has been in an old dairy barn. Changed the closings for the silent auction. The cover art of the catalog has always been some art from the library of award-winning editorial cartoonist, Jeff MacNelly. Jeff spent his final years living in the county. For many years, a gift has been given to the attendees. It’s a small bag of locally roasted coffee beans. The event oozes of charm and has been a sold-out success for several years. 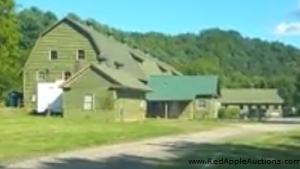 To get a sense of what goes on inside that big green barn, watch the video below. Are you experimenting with new ideas? What are you doing to make your event the best yet? Don’t be afraid of change. It’s the one consistent in life.